Seven Hills Lake Didymo Alert! 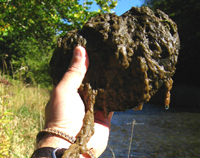 Didymo (Didymosphenia geminata), also known as "rock snot," is a non-native invasive microscopic algae (diatom) that can produce large amounts of stalk material to form thick brown mats on stream bottoms. Didymo threatens aquatic habitat, biodiversity and recreational opportunities. Native to northern North America and Europe, didymo has rapidly expanded its range, invading streams in several western states before moving east. Didymo has been found in several major New York water-based recreational rivers. Historically, didymo has been found in cool, clear, nutrient poor waters but has expanded its worldwide distribution to include nutrient rich waters. Rivers with stable, regulated flows are particularly at risk. How do I know if I find didymo? Color - tan, brown or white (not green); may form long white "tails"
What are the Impacts of didymo? Unlike many other aquatic invasive plants, didymo grows on the bottom of both flowing and still waters. It is characterized by the development of thick mat-like growths (blooms), which can last for months, even in fast flowing streams. During blooms, these mats may completely cover long stretches of stream beds, altering stream conditions and choking out many of the organisms that live on the stream bottom, which can affect trout and other fish by limiting their food. For the recreational user, footing can become very difficult due to the heavy growths. Where has didymo been found in New York? Please note: these are very popular fishing and water-based recreational rivers. It is very likely that didymo is present in other river systems, but has not been detected yet. Do not assume that rivers not listed above are free of infestation. Can didymo be eradicated once it becomes established? There are currently no known methods for controlling or eradicating didymo once it infests a water body. The primary way for didymo to be spread is by anglers, kayakers, canoeists, tubers, boaters and others engaging in water-based recreation can unknowingly spread didymo. The microscopic algae can cling - unseen - to waders, boots, boats, clothing, lures, hooks, fishing line and other equipment and remain viable for several weeks under even in seemingly dry conditions. How can I prevent the spread of didymo? Water recreationists are urged to use the "Inspect, Clean and Dry" method to limit the spread of invasive species, including didymo. Details on the "Inspect, Clean and Dry" method can be found on the "Attention Boaters and Anglers: Don't Spread Invasive Species!" web page. Equipment and gear can also be placed in a freezer until all moisture is frozen solid. 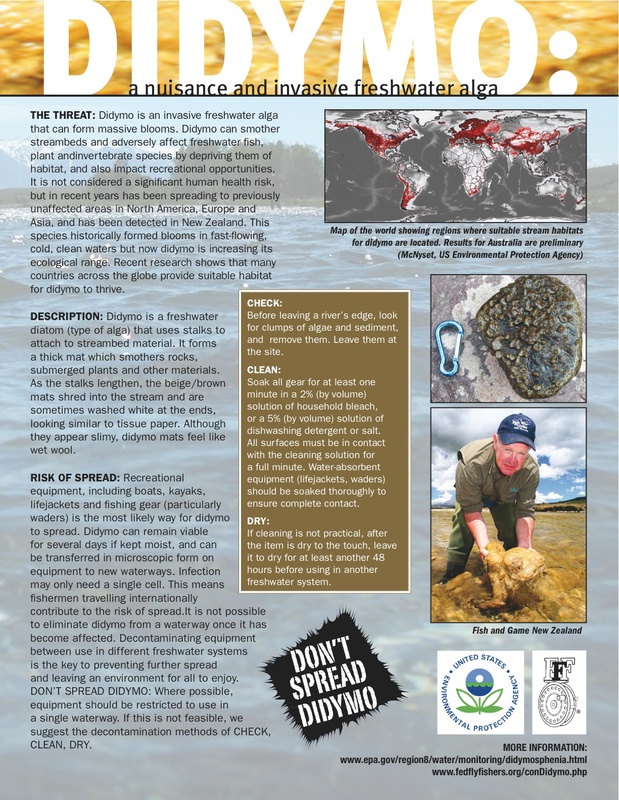 Please note that freezing is a didymo specific treatment and will not necessarily prevent the spread of other invasive species of fish diseases and may damage some gear. Note: If cleaning, drying or freezing is not practical, restrict equipment use to a single water body. Felt Sole Considerations: DEC encourages anglers to consider alternatives to felt-soled waders such as rubber studded boots. Felt-soles, due to their ability to absorb didymo cells and to stay damp for prolonged periods of time, are a major vector in spreading didymo and require special treatment (prolonged soaking in disinfectant).